In case you haven’t heard (ha ha), the Steam sale has arrived, and with that, Tabletop Simulator and most of our DLCs are on sale 20-60% off! Get it while it’s smokin’ hot! 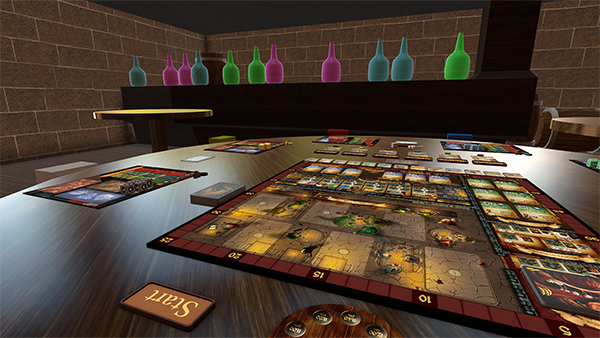 Our latest DLC is Cavern Tavern, created by Final Frontier Games, now available in Tabletop Simulator! We also made some great improvements to the Turns Menu. You can customize your turn orders, disable interactions and enable players to pass turns to another! Created by Final Frontier Games. Can be played solo or with up to 6 players. If playing solo, just press the Start button for auto setup and follow the instructions on page 18 of the rulebook. For multiplayer, each player must select a character first, then press start for the automated setup. Updated the menu to match the rest of the UI. 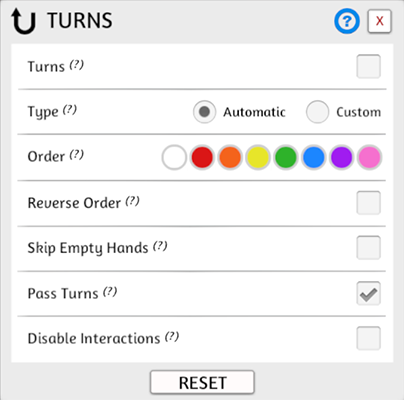 You can now create custom turn orders. You can now Disable Interactions for players when it’s not their turn. Moved end turn button higher up, so it doesn’t block broadcast messages. Pass turns from the player names (if box is checked). Player names are ordered the same way as turn order on the top right. You can change the turn order by moving the color circles in the menu after choosing Custom. Feel free to make pull requests to improve the documentation. Cast now returns the table as a hit object. BBCode now works on creatButton(). Fixed getBoundsNormalized() center being wrong. SAVE & EXIT removed from Grid, Lighting & Hands Menus as it will now automatically save each setting. Updated Hands menu to match the rest of the UI. Reset button added to Grid, Lighting & Hands menu. Smooshed thumbnail images instead of cutting them off in the Games Menu. Lots of miscellaneous improvements throughout. Improved player contextual options to match what is available. Alt Zoom doesn’t clip super wide objects offscreen. Fixed issue with not being able to see Rotation Snap points when placed. Fixed issue with custom infinite bags spawning objects with the wrong rotation.